Hit the range with Zinc-plated, steel case with a greater feed and better reliability. Silver Bear, .45 ACP, FMJ, 230 Grain, 150 Rounds is rated 4.6 out of 5 by 17. Rated 3 out of 5 by Olg Guy from OK for the price Cheap practice ammo, but if its like other Russian stuff its dirty. Haven't really used it much and really don't expect much for the price. recommend it on price only. Rated 4 out of 5 by Todd from Great ammo at a great price If you are on a budget and do not reload this is the ammo for you... It shoots well and is surprisingly accurate... You can not go wrong buying this ammo. I used it in a 1911. Sig and XD with no jams and no issues. It really liked the XD and shot best out of this pistol. Rated 5 out of 5 by JohnT from Works great No problems. 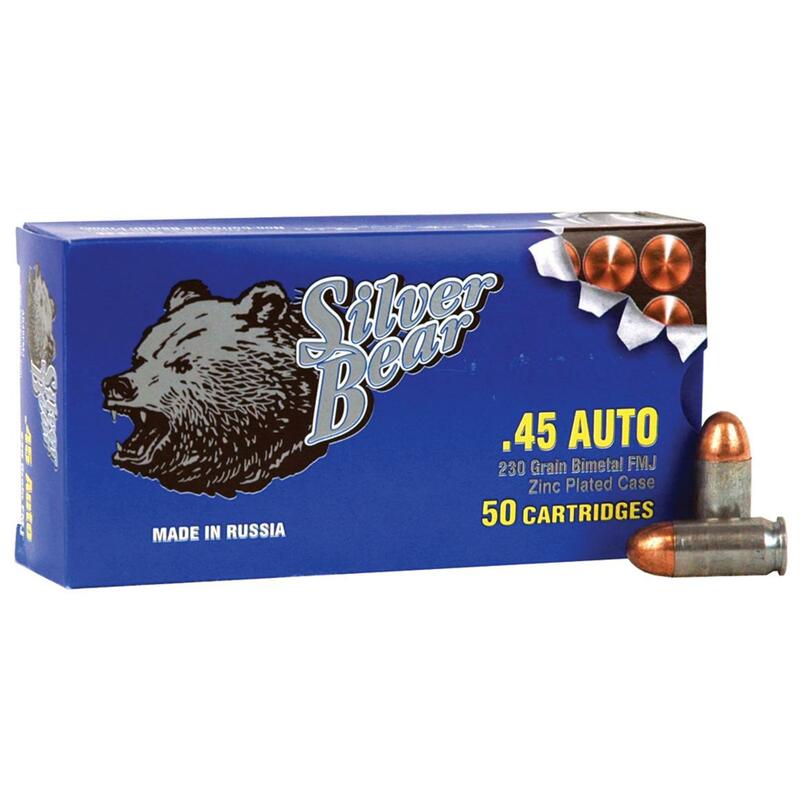 Rated 4 out of 5 by Bob 66 from Silver Bear .45 ACP When I got ready to load magazines, I found that the ammo was covered with a light oily residue. Had to clean the ammo before loading. Fired the .45 ACP in three handguns, Colt 1911, Smith & Wesson M&P .45 and Springfield XD. There were no failures to feed, fire or eject. There were no "flyers" and the rounds were as accurate as the shooter. A little more cleaning required than with the high priced ammo. For the price I would recommend. Will buy more. Rated 5 out of 5 by Silver Fox from Great Value...For Shooting I have used Silver Bear Ammo in 380-9MM and 45's. Ammo worked very well in all cases-feed well, no jams, no misfires. Best of all PRICED RIGHT...RECOMMEND! Shoots great and hard hitting.